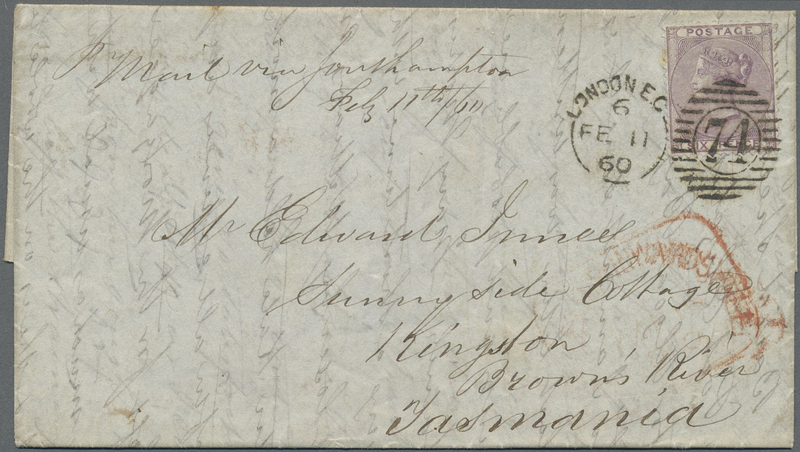 16170 Brief (cover) 10 Bx (SG 29)(3) 1856 (Jan 7), Destination CRIMEAN WAR: Cover from London to a Colonel surving in the British Army at Crimea, franked with 1855 1d red-brown on bluish paper, Wmk Large Crown, Perf 14, vertical strip of three (one short perf, still fine) tied by ''44'' numeral, with red London despatch cds (JA 7, 1856) on reverse. 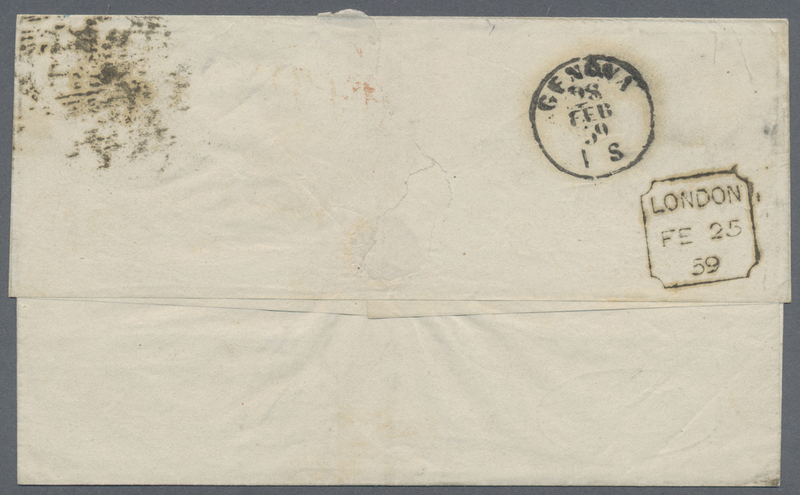 An interesting address. 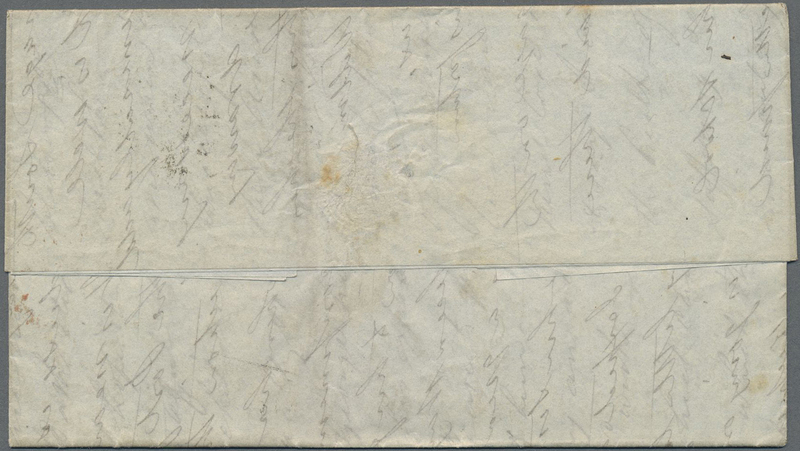 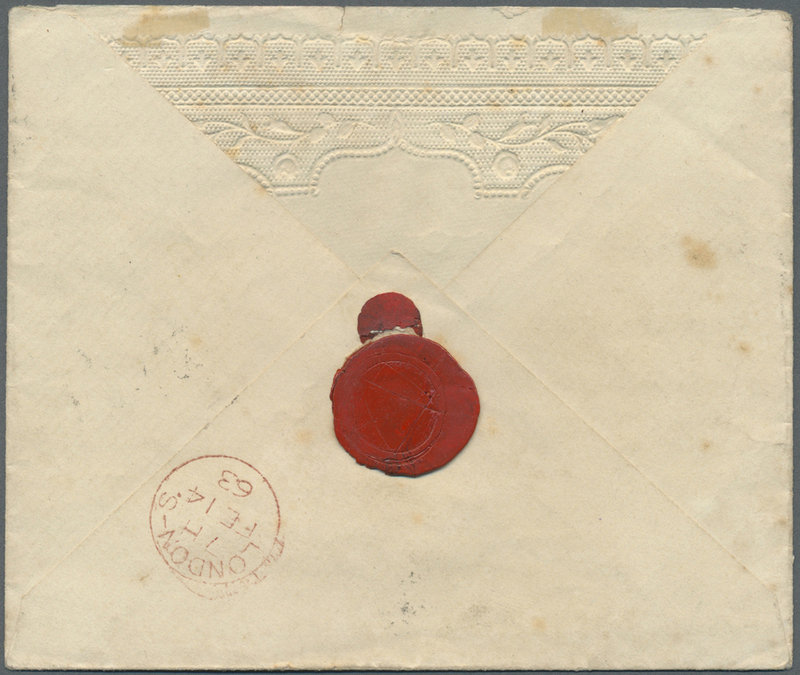 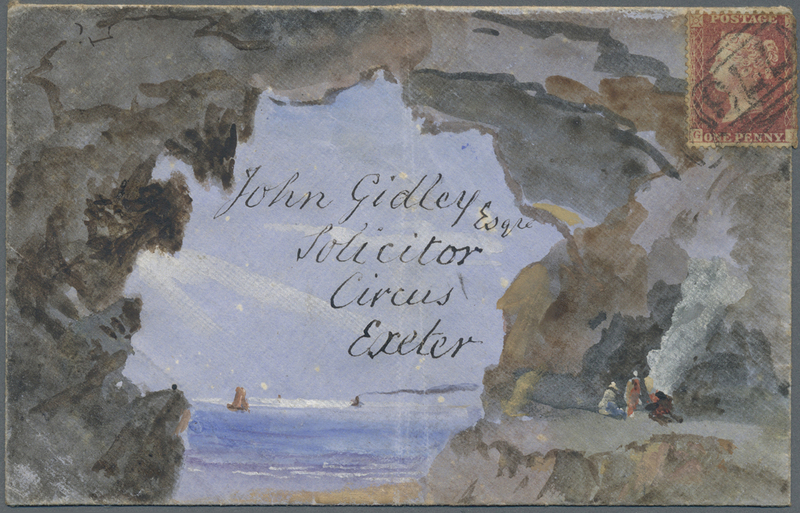 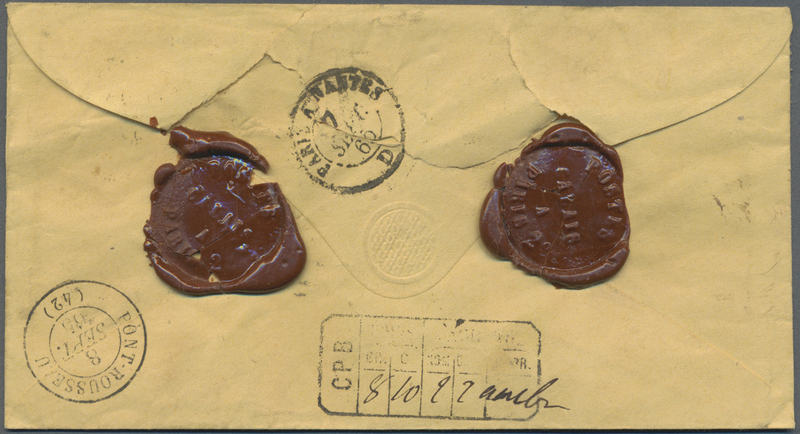 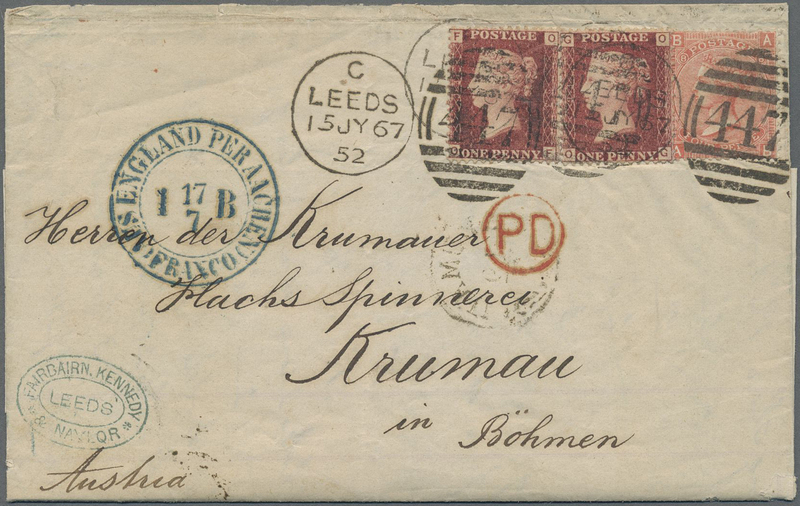 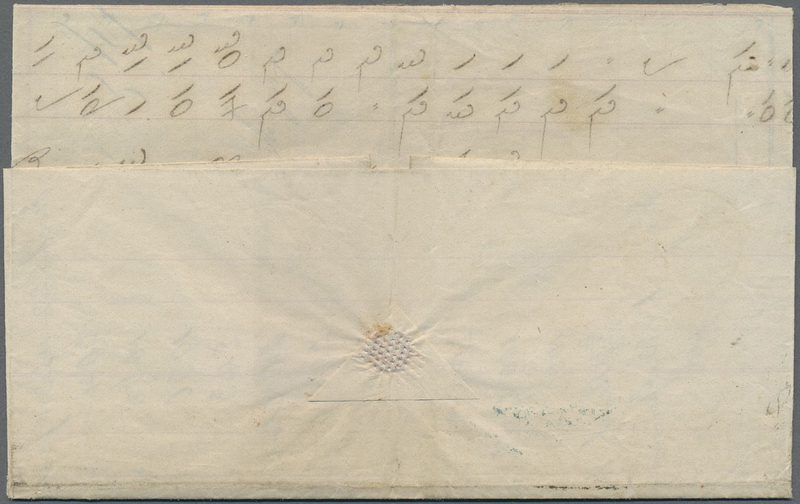 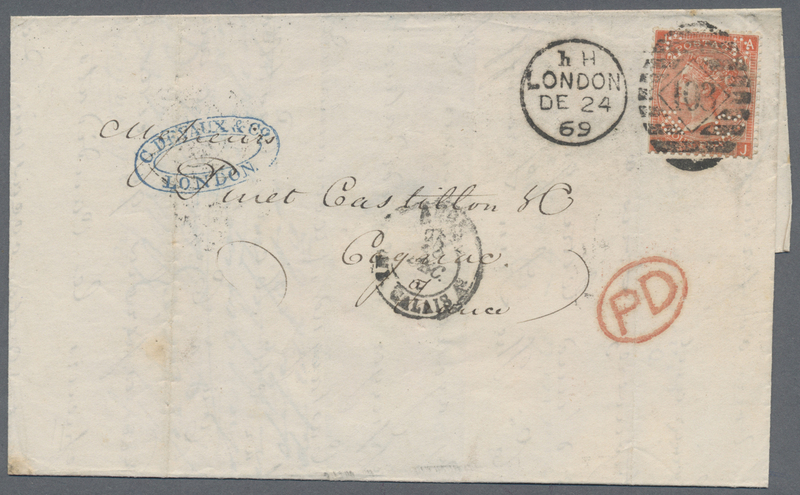 16183 Brief (cover) 13 (SG 66) a.o. 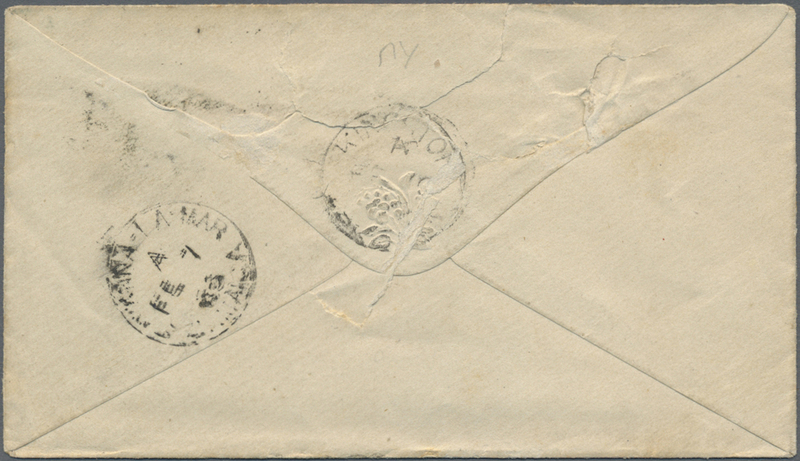 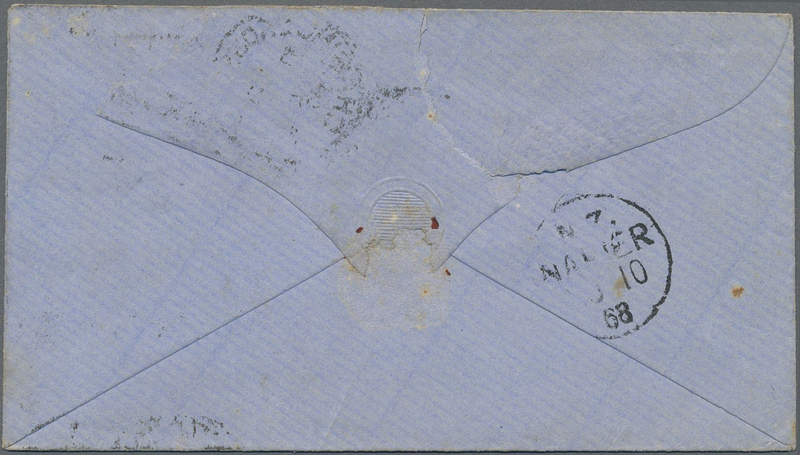 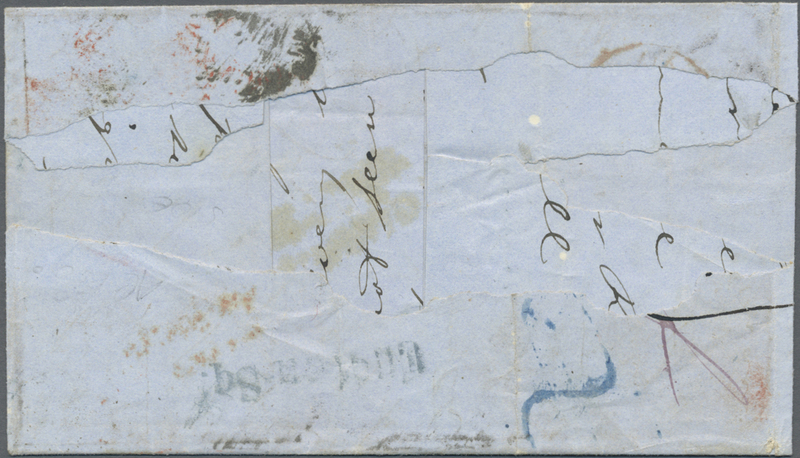 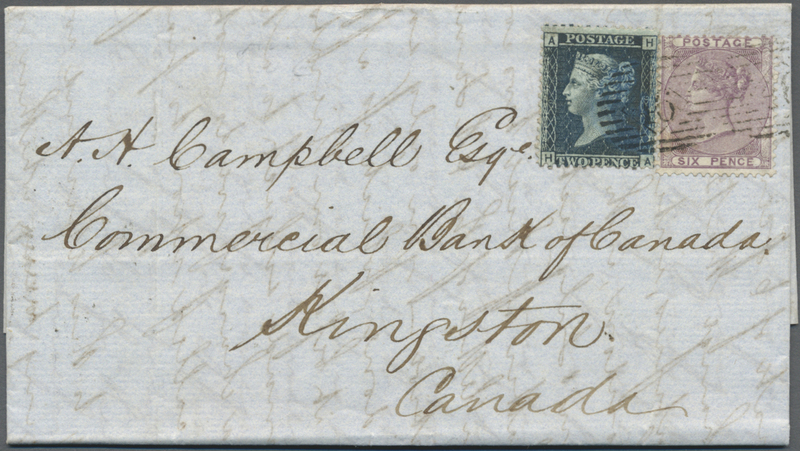 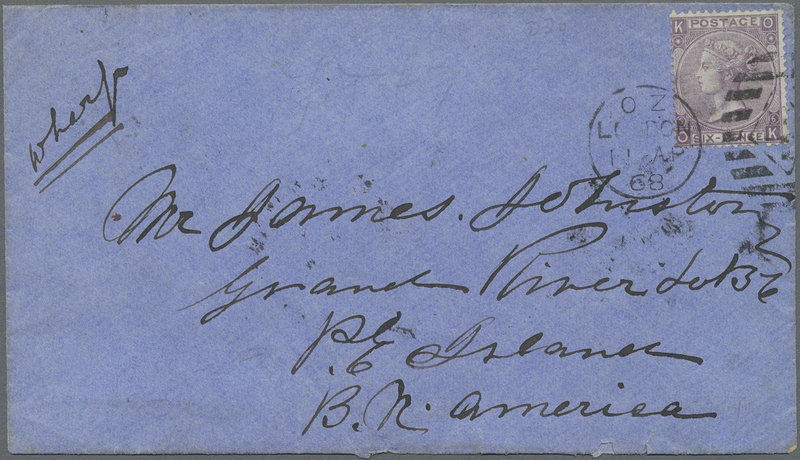 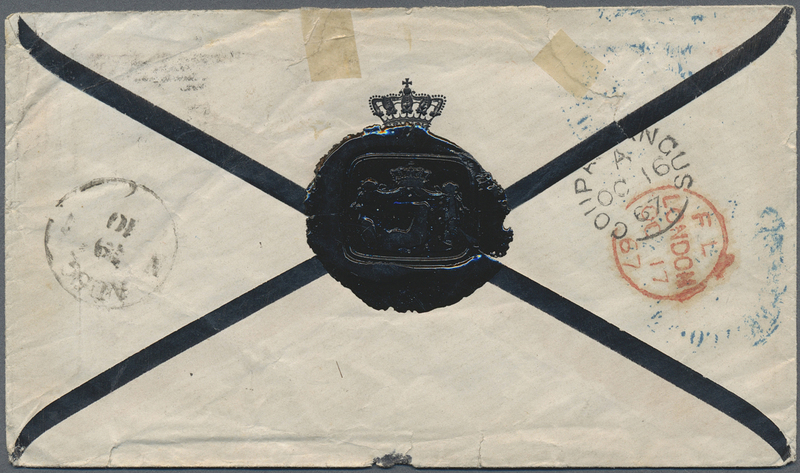 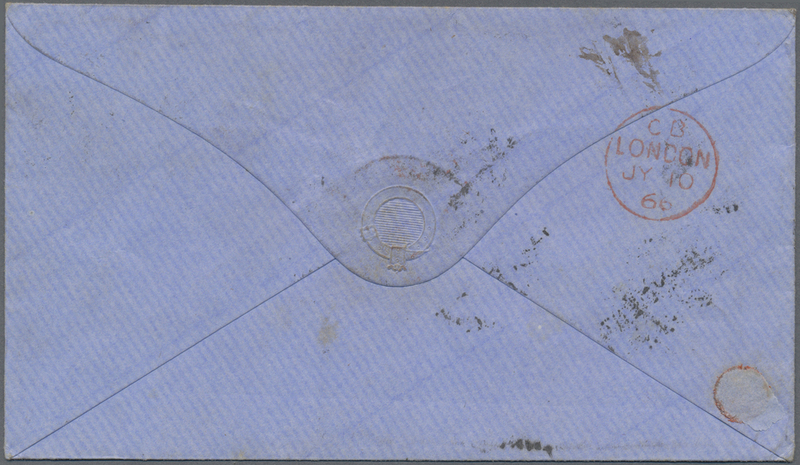 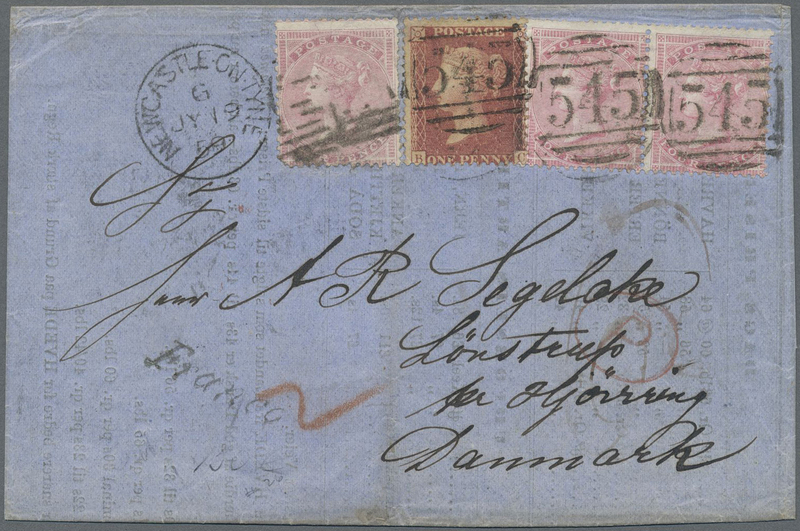 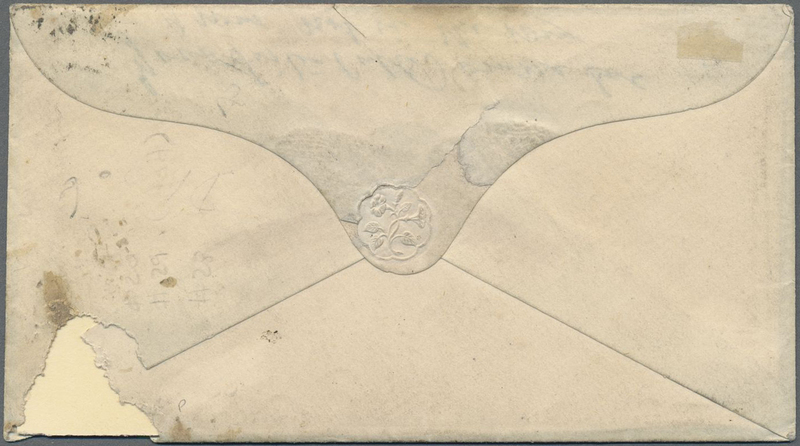 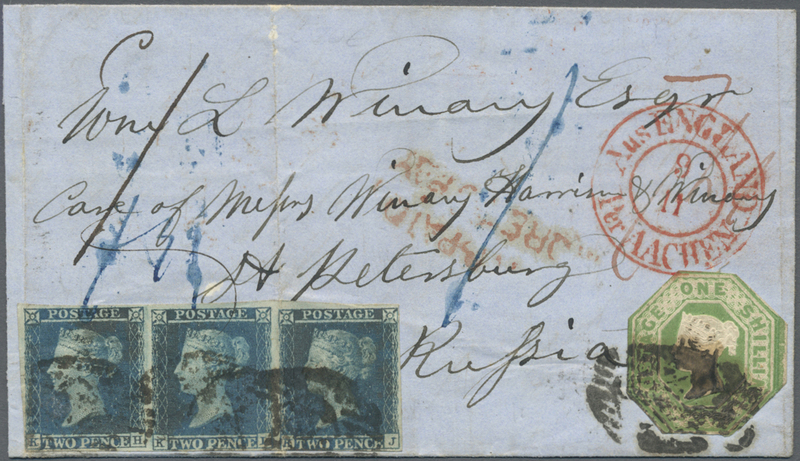 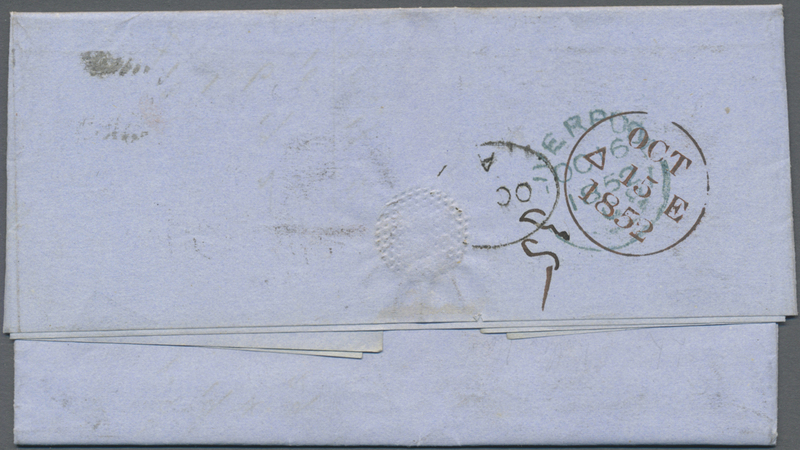 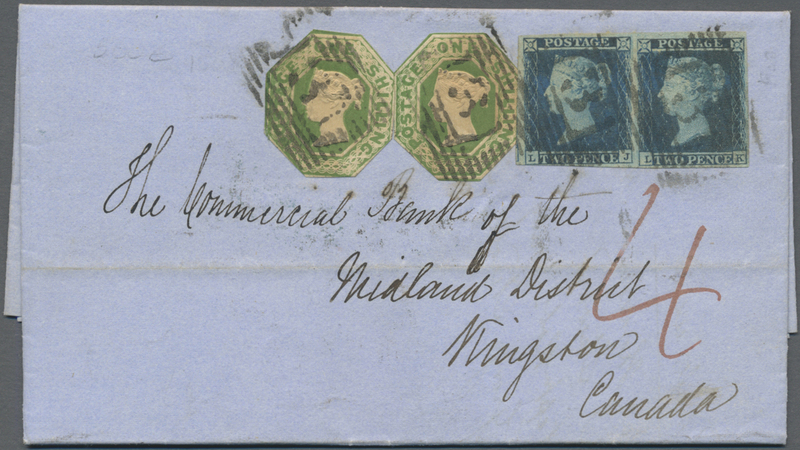 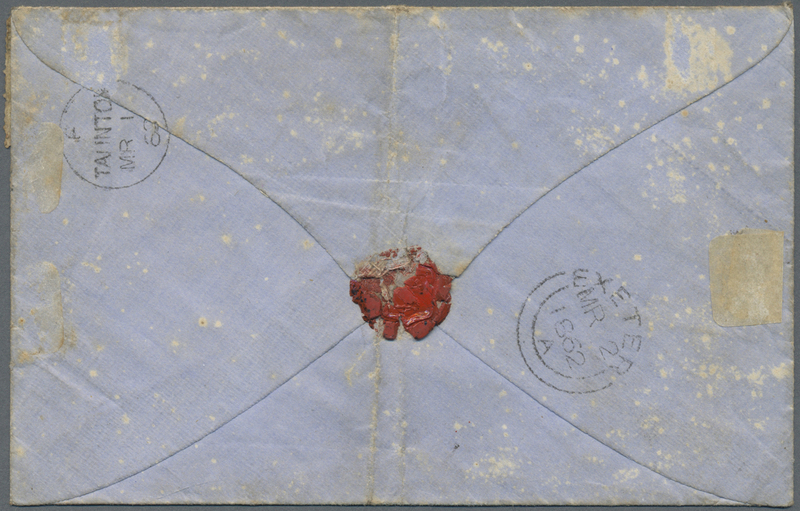 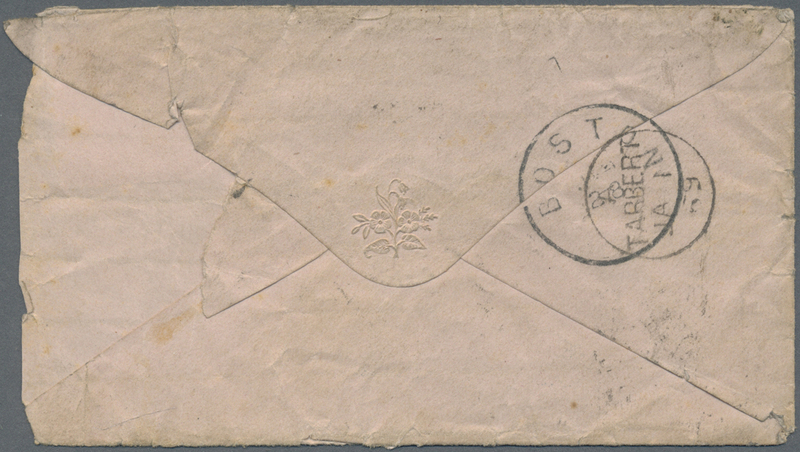 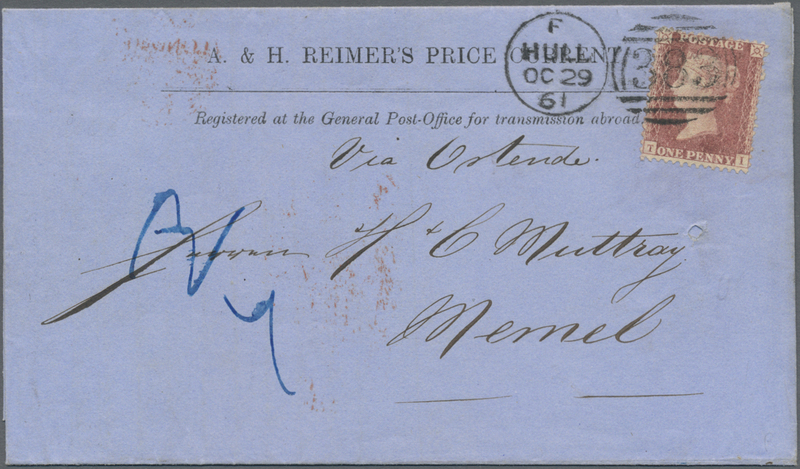 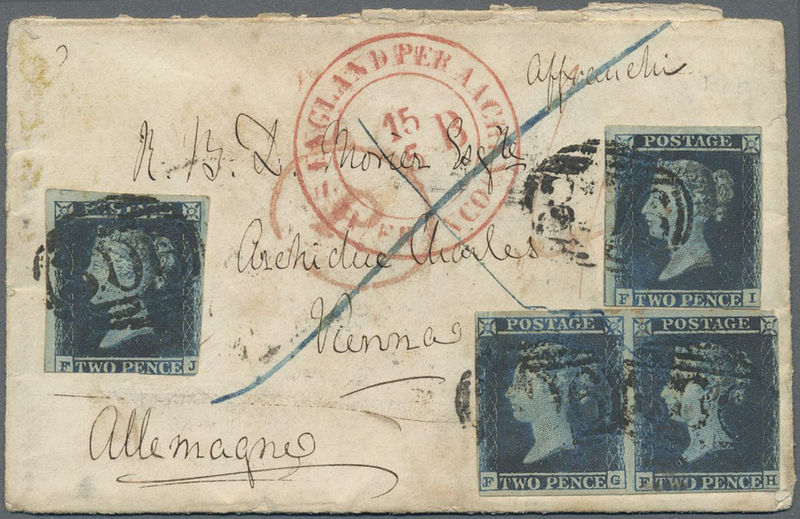 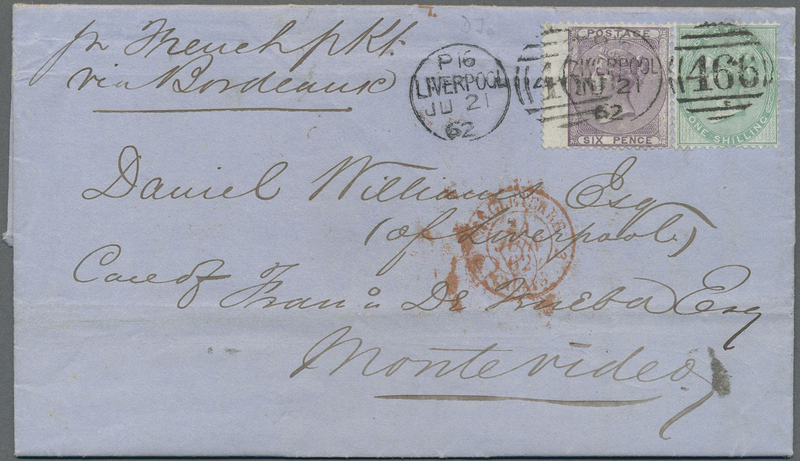 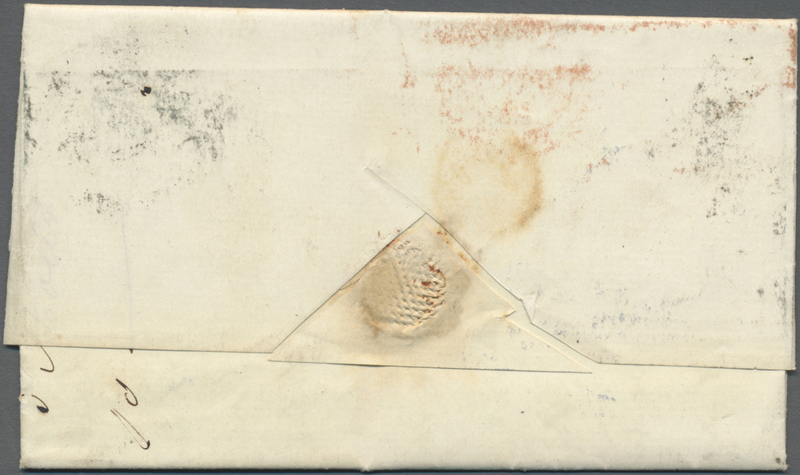 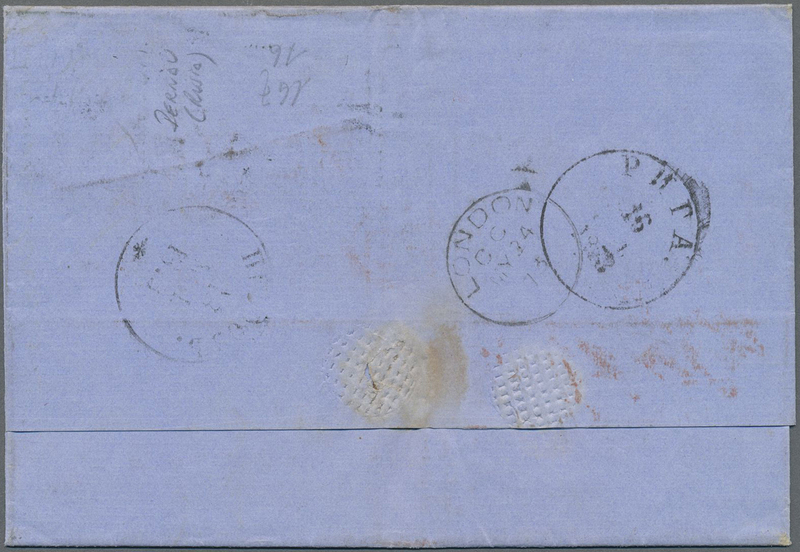 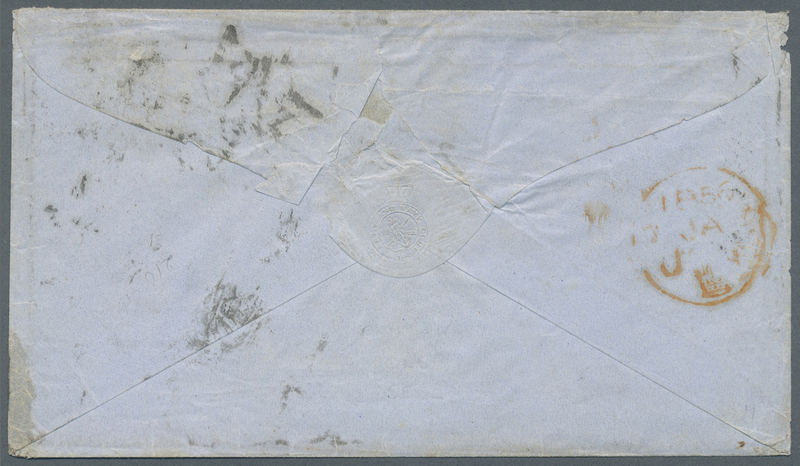 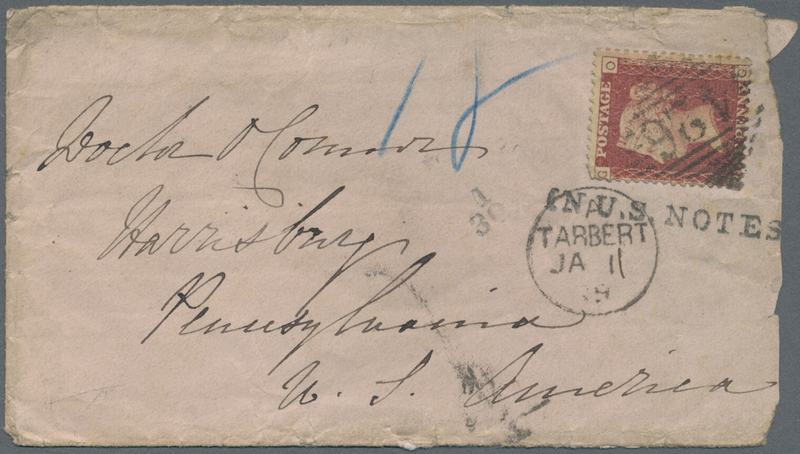 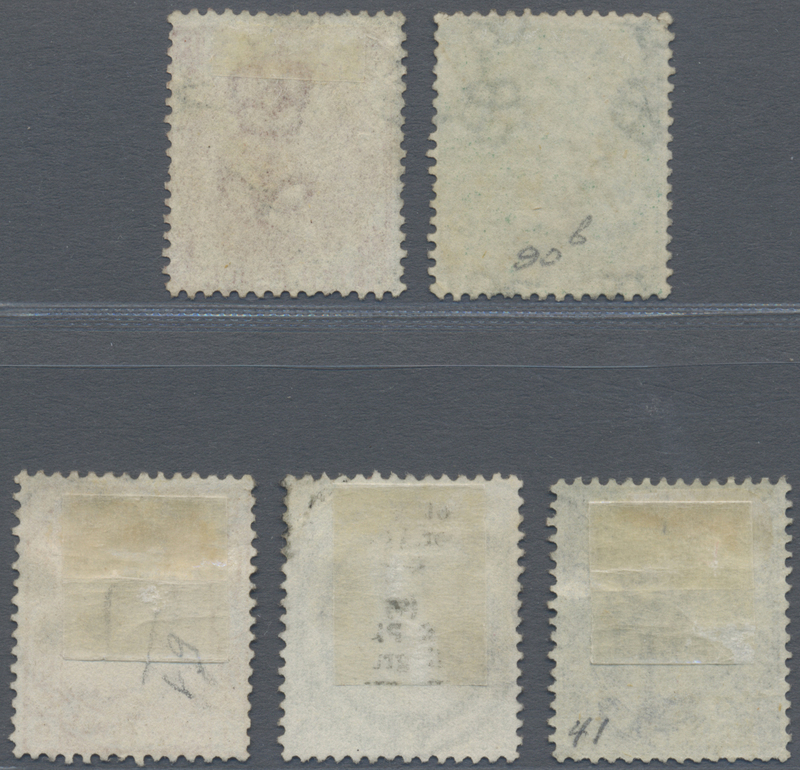 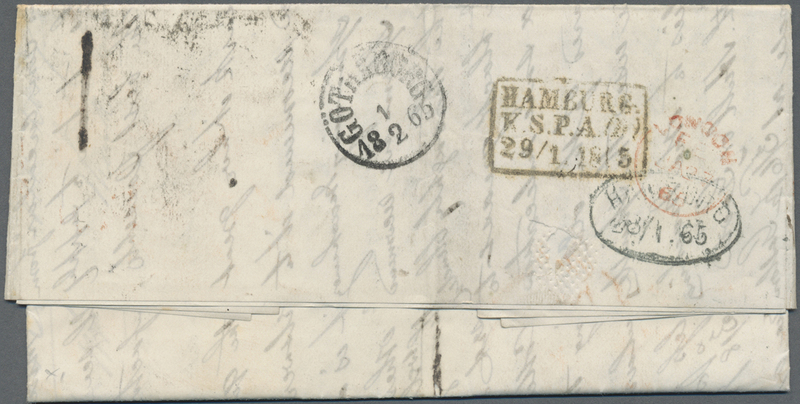 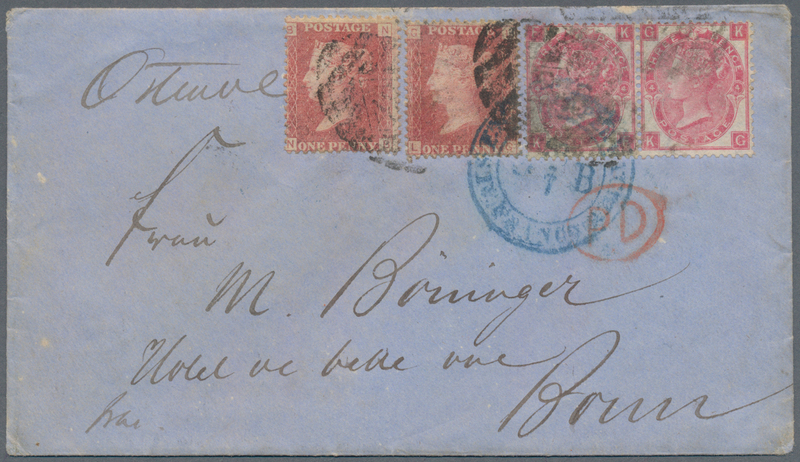 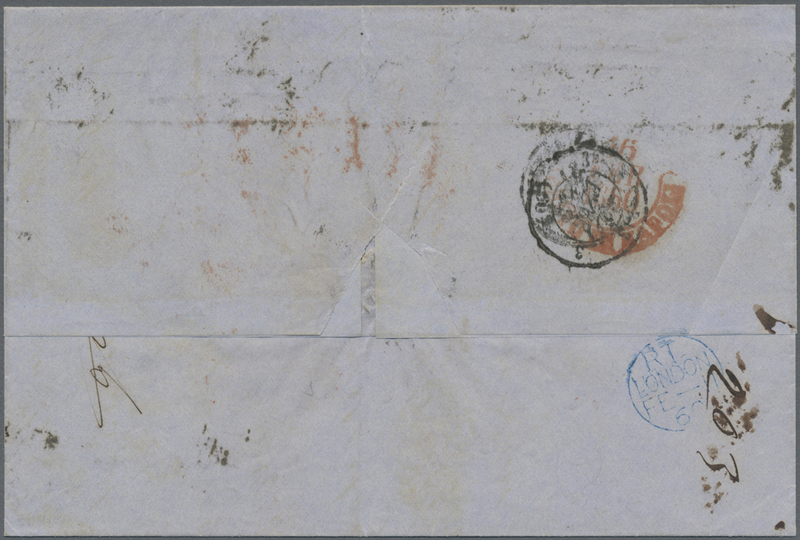 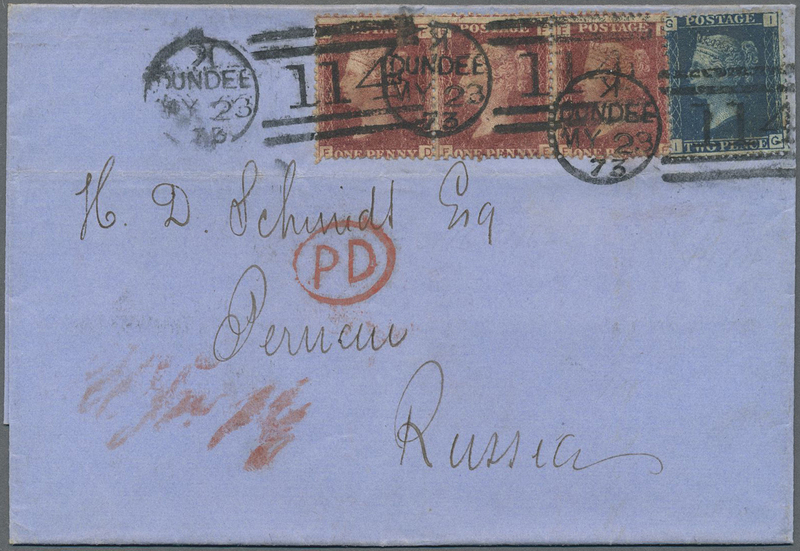 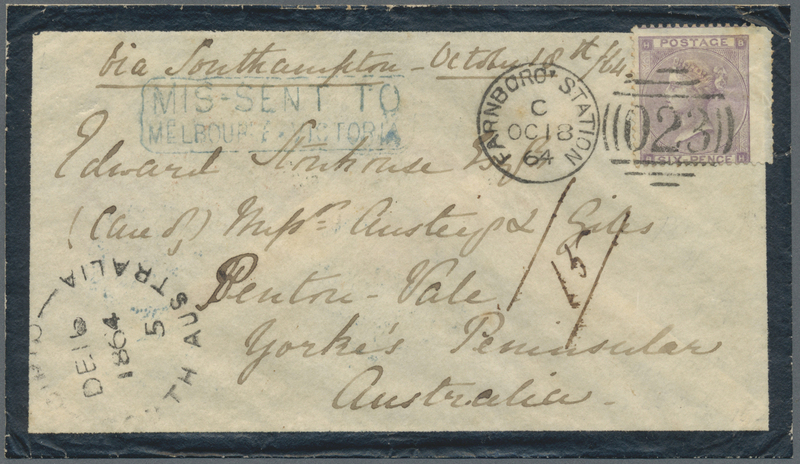 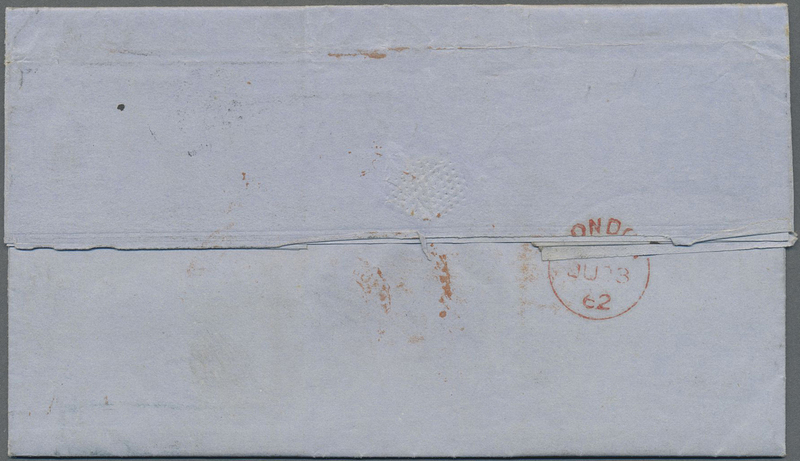 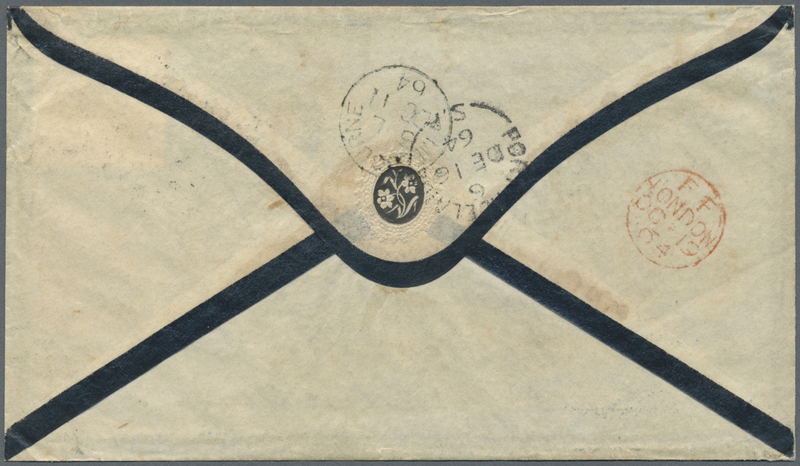 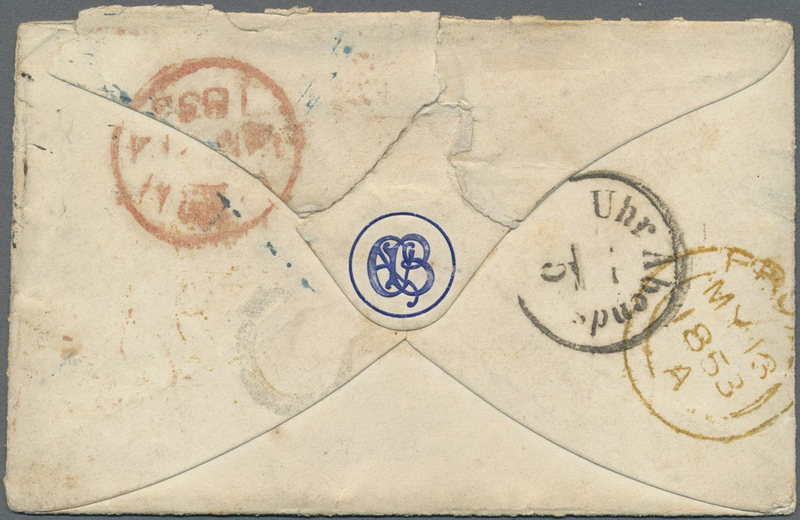 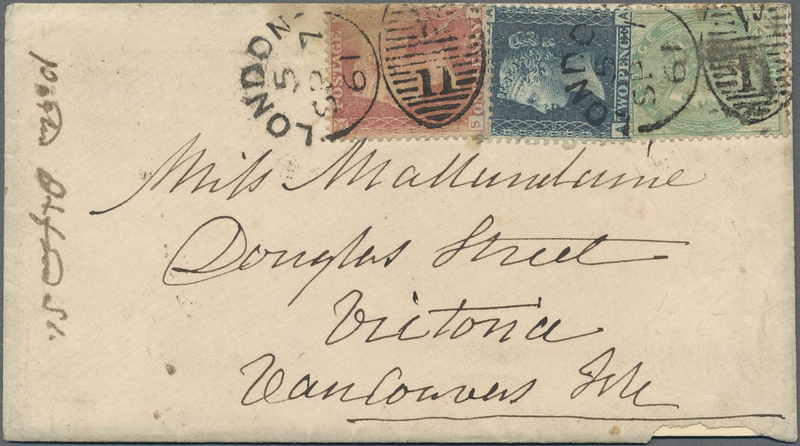 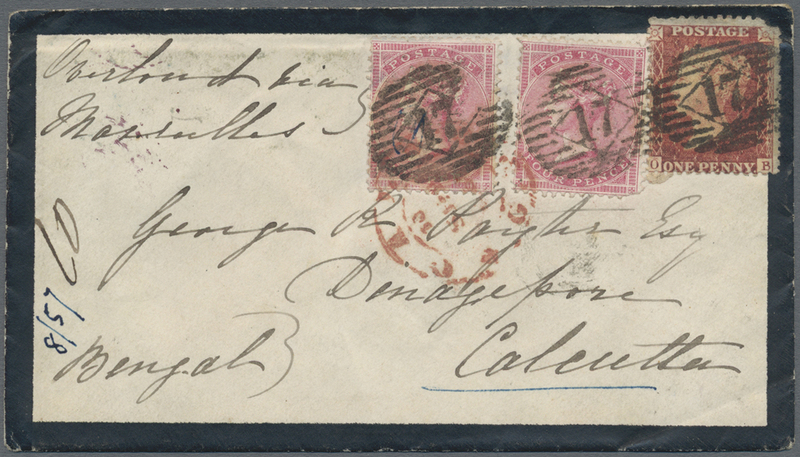 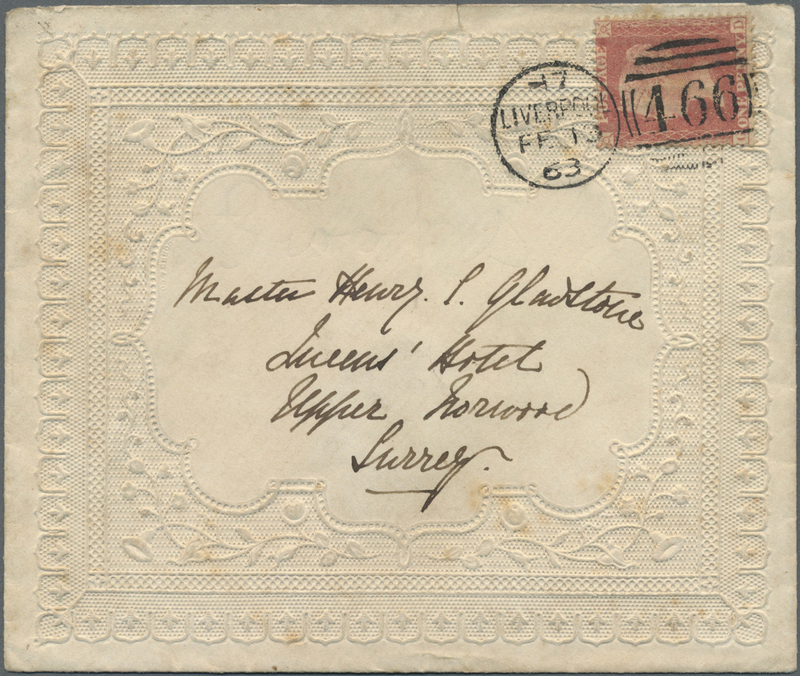 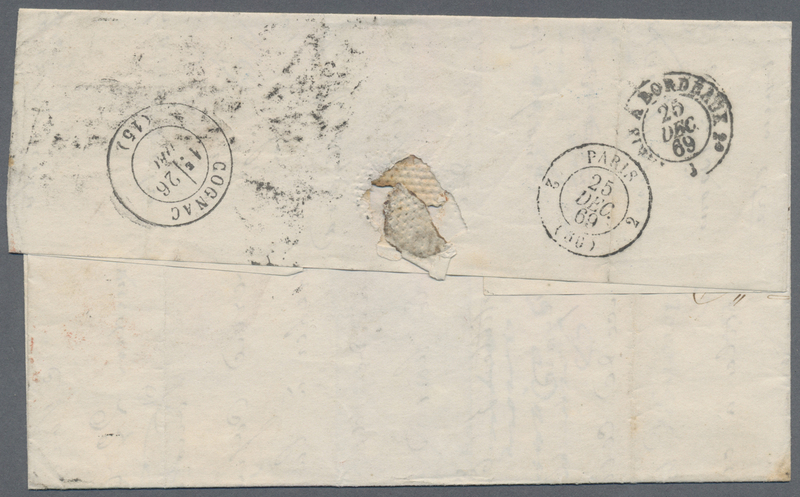 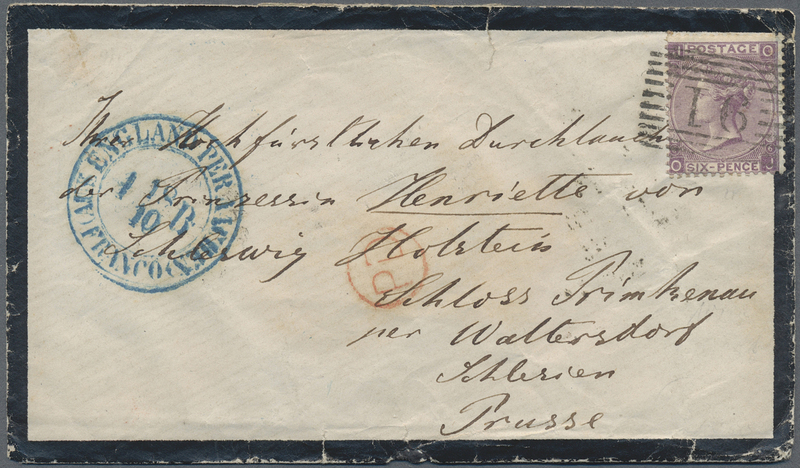 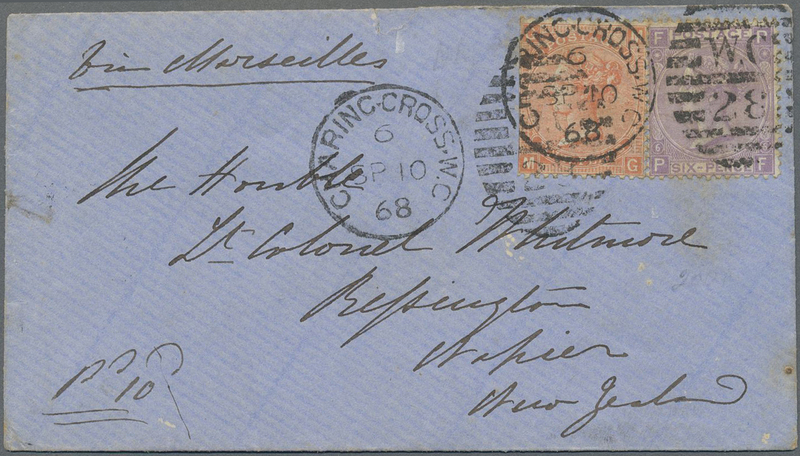 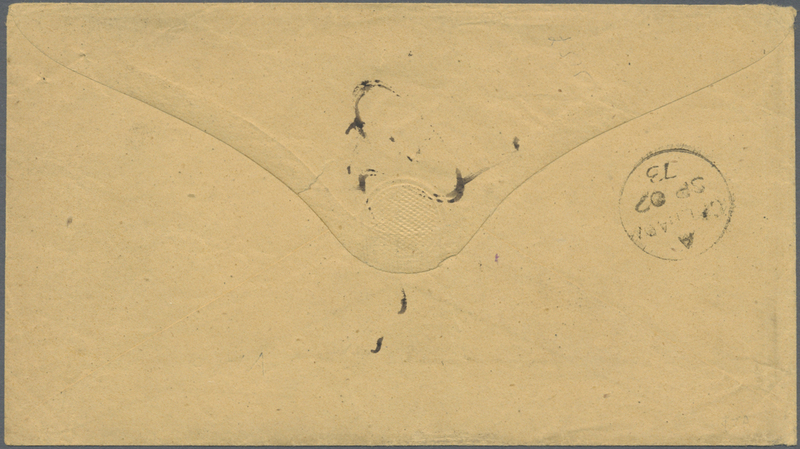 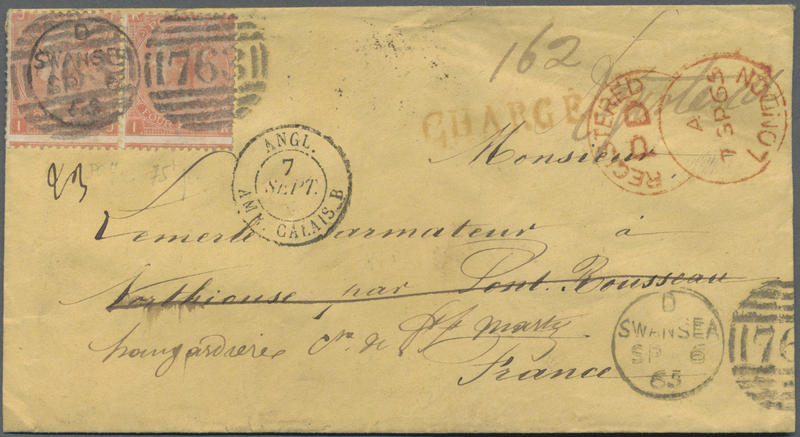 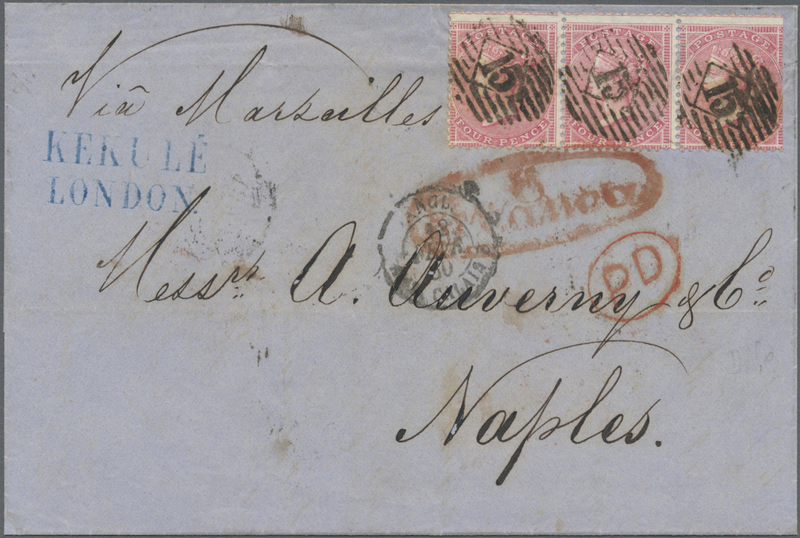 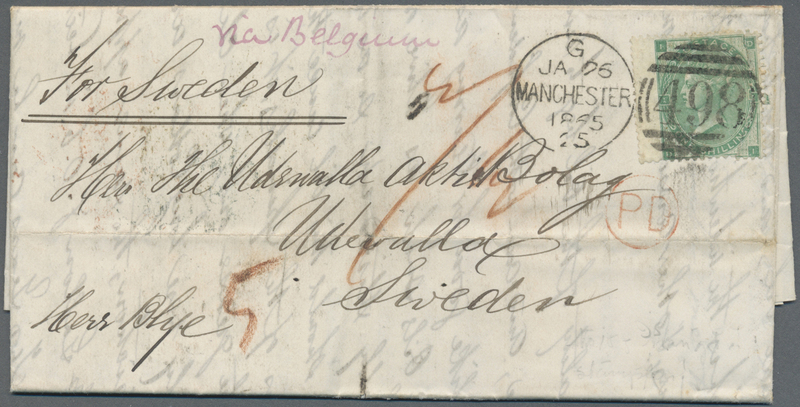 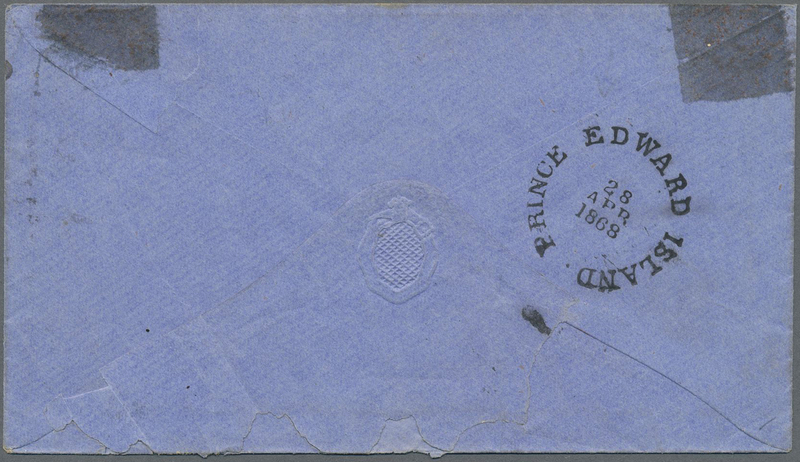 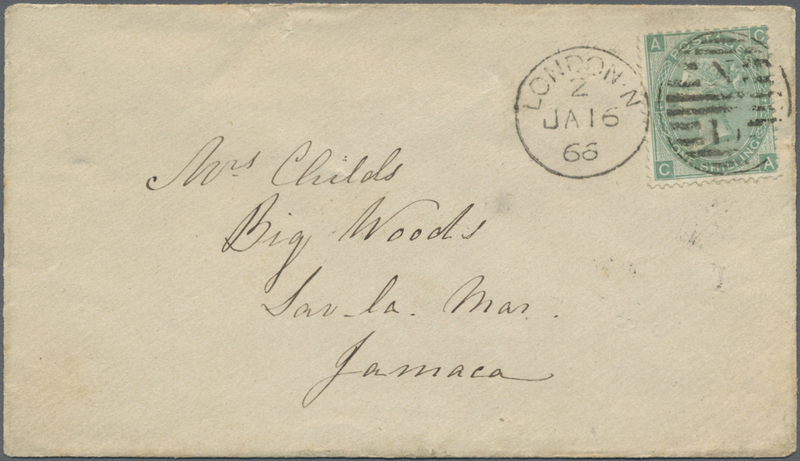 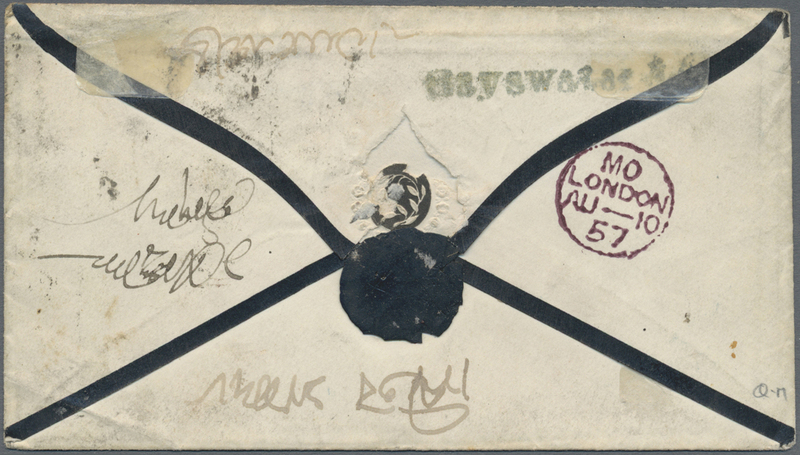 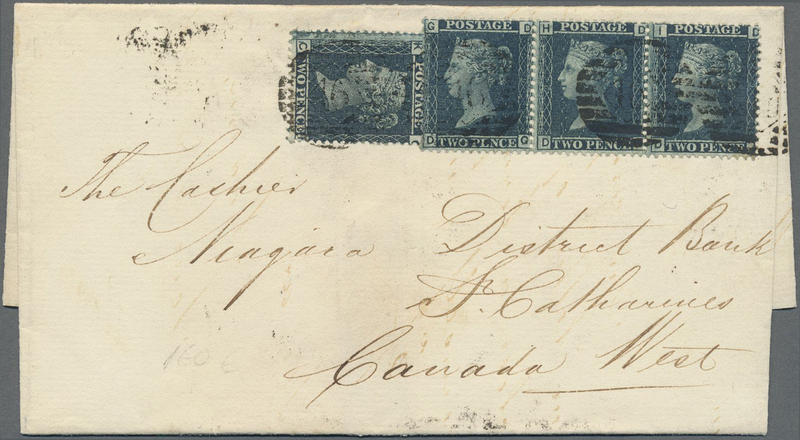 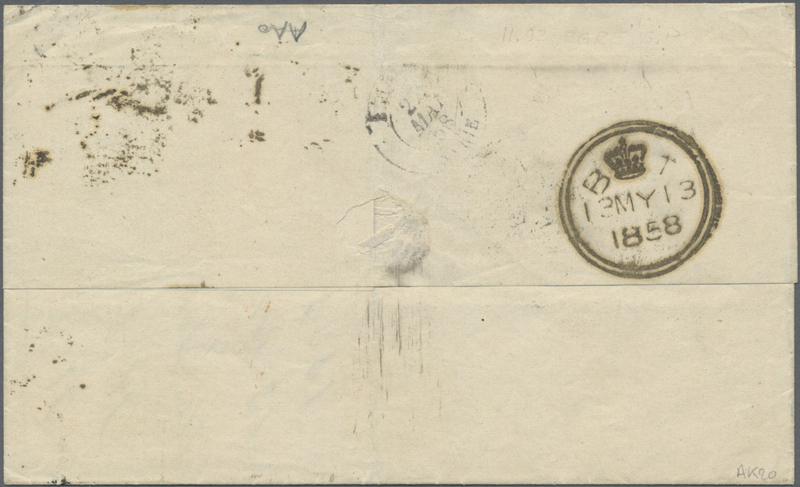 1859/1861 Two covers to India both franked 1855-57 4d. 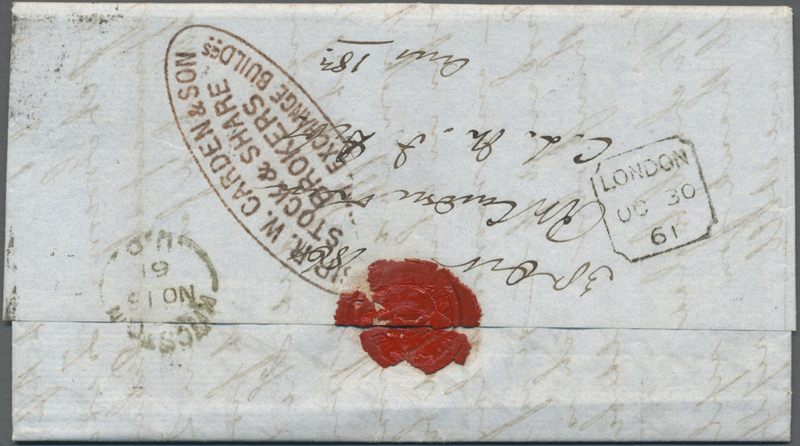 rose-carmine horiz. 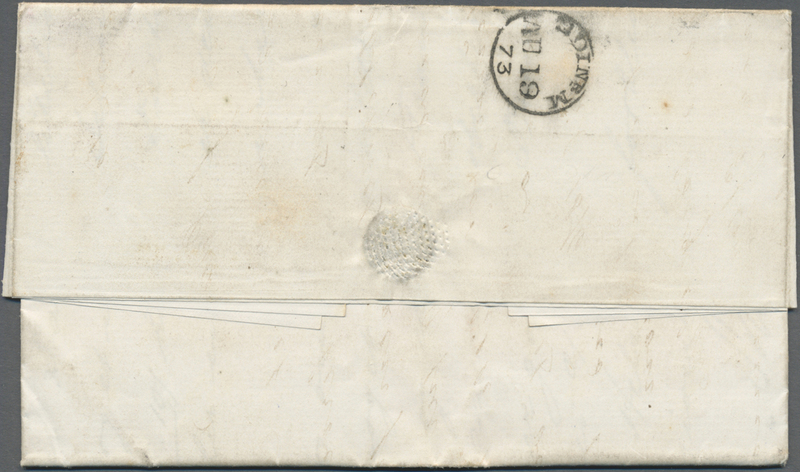 pair plus 1d. 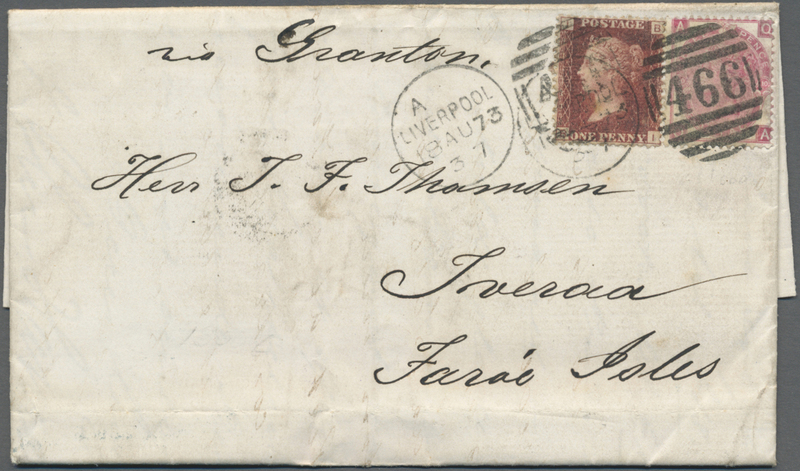 red-brown, the 1859 cover from London to a member of the Royal Horse Artillery at Lucknow, the later one to Furreedpore, Bengal. 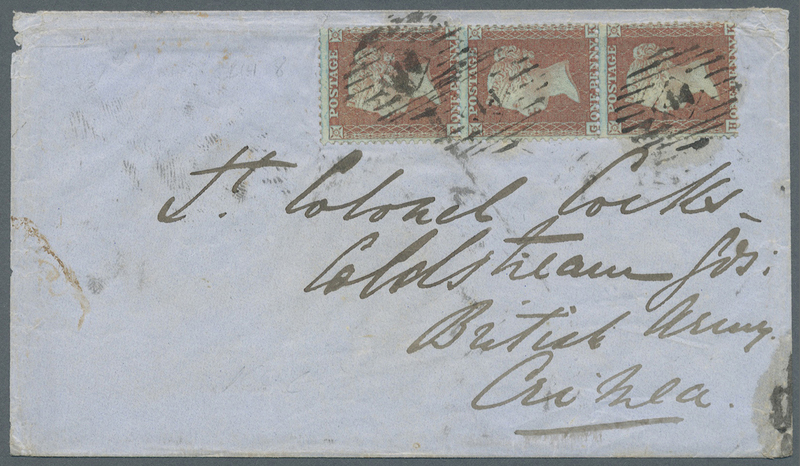 16203 Brief (cover) 27 1865. 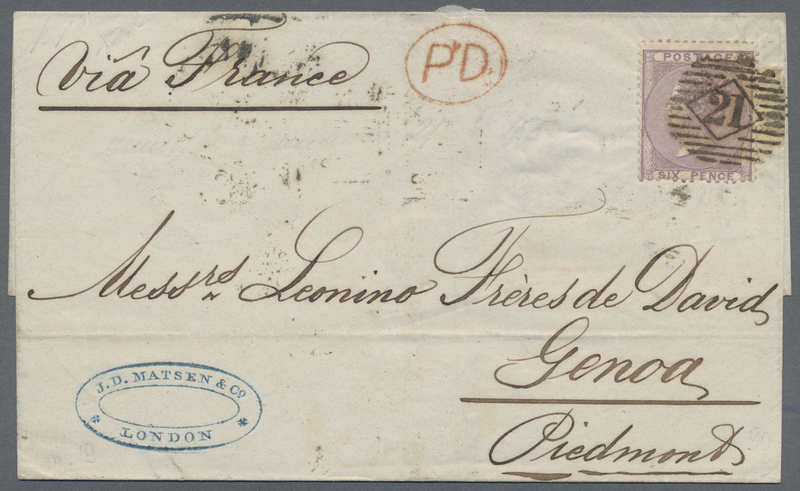 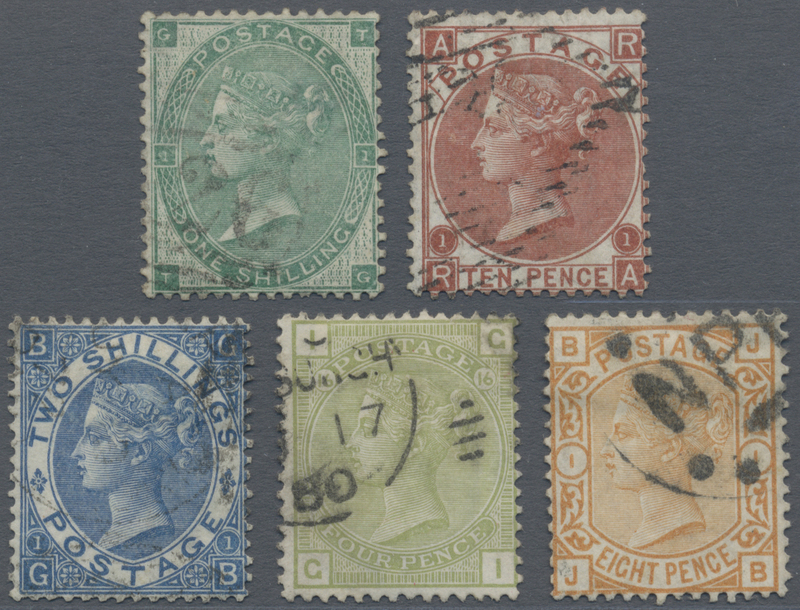 1 Sh green, tied by Manchester Duplex cancel, prepaying the single letter rate to ROME, Papal States. 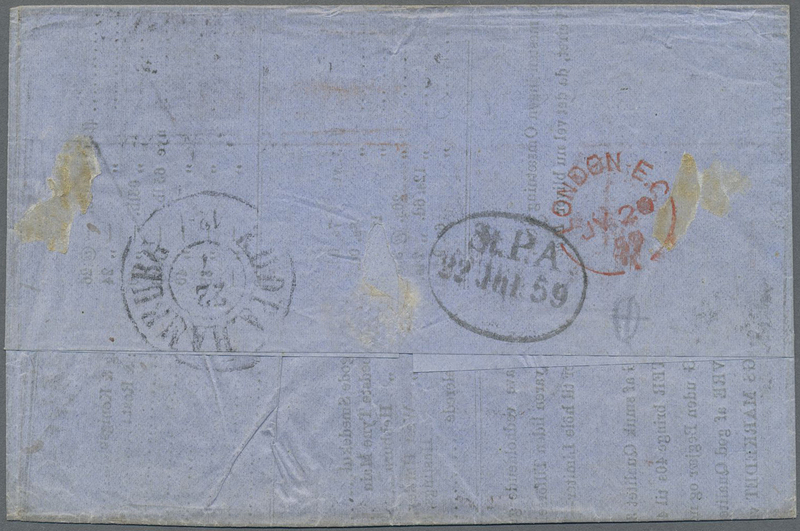 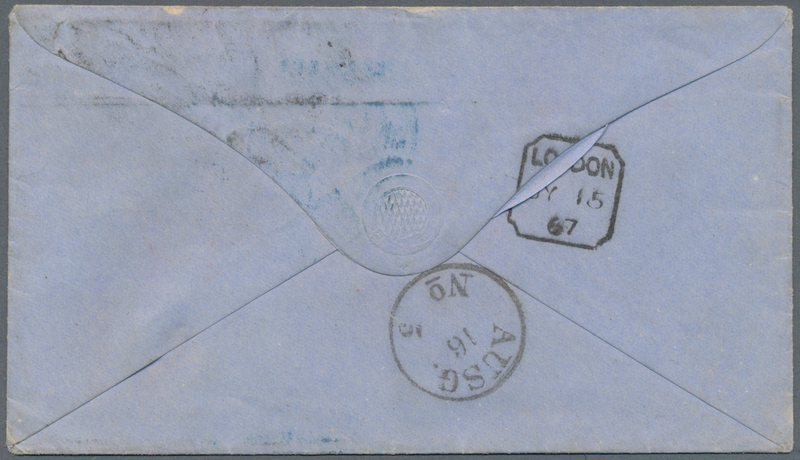 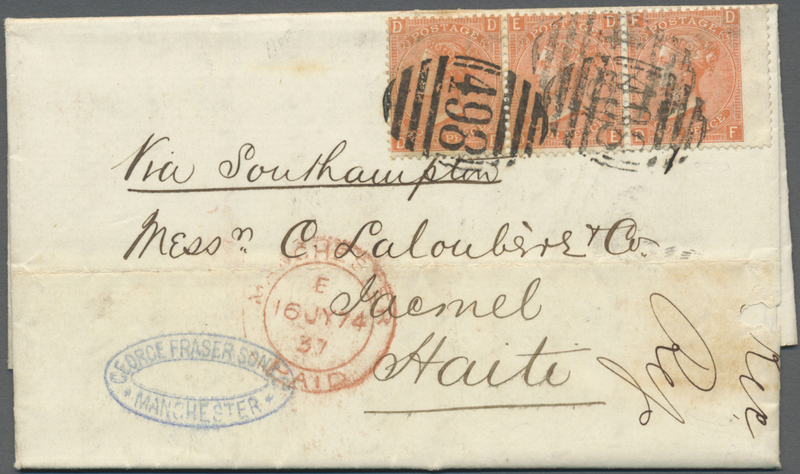 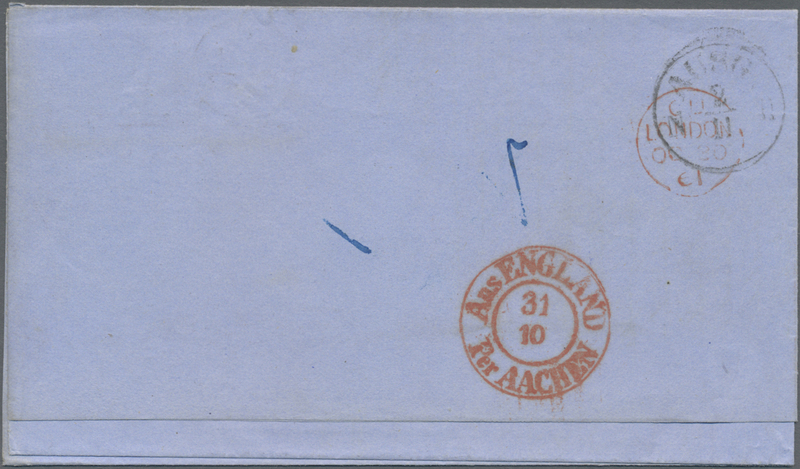 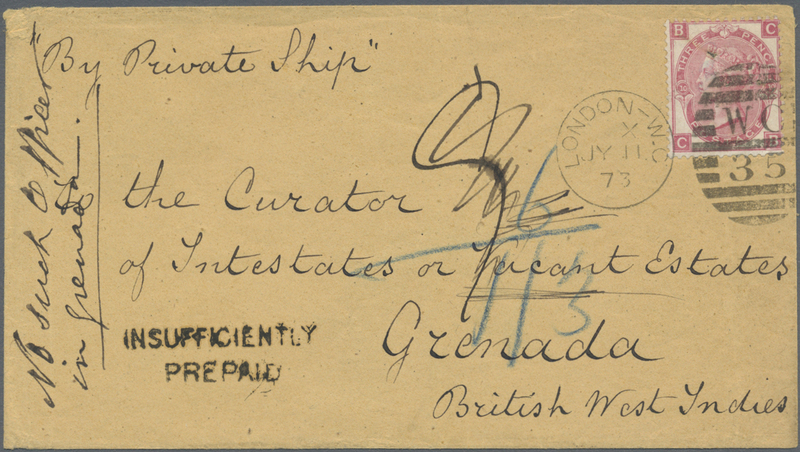 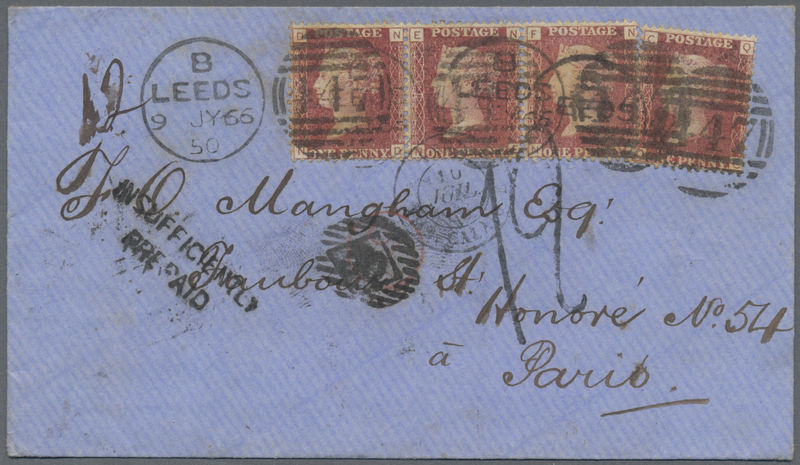 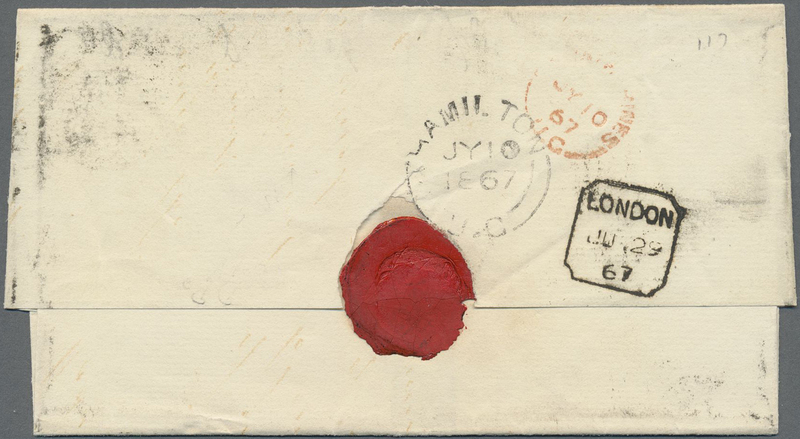 Blue London transit on reverse, French Entry (TPO. 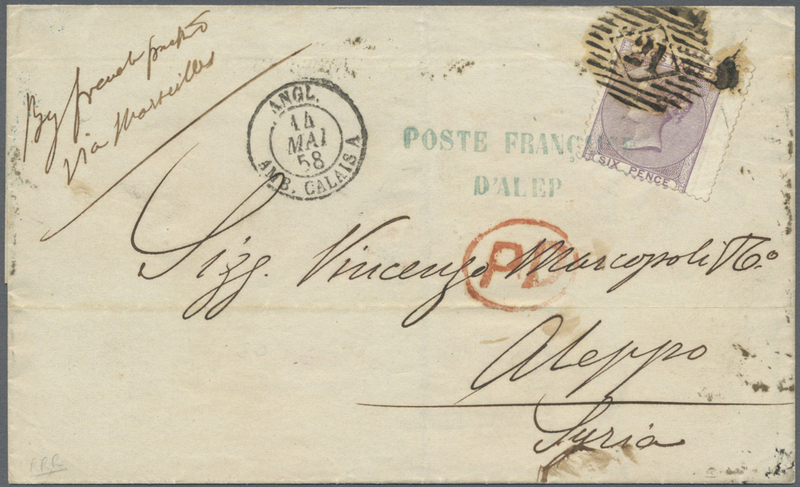 CALAIS) on front, Paris transit and Rome arrival on reverse.